One highlight of the New Year will, of course, be the the official reason for Pope Benedict's mid-April jaunt to the East Coast: the 200th anniversary of American Catholicism's first expansion. Nineteen years after the diocese of Baltimore was erected to oversee the small community spread across the thirteen original states, on 8 April 1808 Pope Pius VII established new local churches at Boston, New York, Philadelphia and the Kentucky frontier village of Bardstown; the latter was moved to Louisville in 1841. At the same time, the founder-bishop of Baltimore John Carroll (who'd sought the new dioceses for over a decade) was made an archbishop as the Premier See was elevated to metropolitan status. 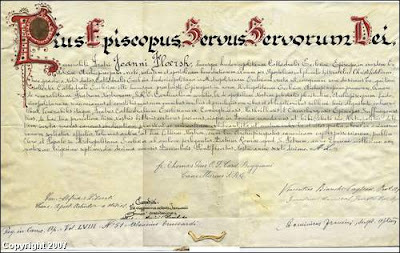 Despite the appointments, however, it would still be another two years before Carroll's pallium arrived from Rome and, with it, the bulls permitting the ordination of the new bishops. "Because we are fortunate to have an excellent archdiocesan history [1987's "An American Holy Land"] … we decided to focus most of the content on the history of parishes," Archbishop Joseph E. Kurtz writes in the foreword. "This is the story of a holy land and a stalwart people who did great things in service to the Gospel," he adds. Each parish has at least a page devoted to its history, with photos from its past and present. There are portraits of 19th century bishops, images of stained-glass windows and pictures of such buildings as Holy Cross Church in Marion County, considered the cradle of Kentucky Catholicism. There also are old photos of schoolchildren at St. Peter Claver; children in First Communion outfits at St. Therese; floodwaters surrounding Our Lady Church in 1937; and women waving banners at Freedom Hall at a service celebrating the millennium in 2000. It was a difficult beginning, to say the least. But a whole Catholic society rose up in New York to welcome and nurture waves of immigrants who depended on their church for spiritual and sometimes physical sustenance. "The real unsung heroes, and there were many, will always be unsung," said Monsignor Thomas Shelley, the unofficial historian of the Archdiocese of New York. "They don't leave a record." Shelley would know, because he is as familiar as anyone with the records that are available. He has just completed "The Archdiocese of New York: The Bicentennial History, 1808-2008" (Editions du Signe), written to coincide with the New York church's 200th birthday in April. Cardinal Edward Egan wanted the volume written, and Shelley, a soft-spoken historian highly regarded by his fellow priests of New York, was the obvious choice. He has taught at Fordham University in the Bronx for the past 11 years and spent the previous decade at St. Joseph's Seminary in Yonkers. "His vivid and insightful telling of the story of the Catholic Church in New York amazes the reader with the wonders that have been achieved," Egan writes in the introduction. "Still, it reminds us that in all that we do, we depend utterly upon the loving providence of the Triune God." Sitting in his office recently on Fordham's Rose Hill Campus, Shelley, 70, talked about parsing through two centuries of Catholic history in New York to produce his 632-page, lavishly illustrated volume. He started with the parishes, the focal point of Catholic life, and was able to get hold of histories for about half of the archdiocese's 405 parishes. Also in the archives of the archdiocese, he found some frank correspondence between pastors and their bishops. "It was interesting to see the differences years ago between the city parishes and country parishes," he said. "Most pastors came from the city. An assignment in the country was quite an adventure. Some couldn't take it." While the modern Catholic Church is known for being hierarchical, the first parishes in New York were founded by ordinary folks, Shelley said. A group of immigrants would form a corporation and raise enough money to buy a piece of land and build a church. Then they would ask the bishop to send them a priest. New York City's first parish, for instance, was formed in 1785, when 22 lay people organized St. Peter's Church on Barclay Street. Where did early congregations meet until they had churches? "Many parishes organized in stables," Shelley said. "Often it was a very modest beginning." Among other Gotham events on tap: a late March "Mambo Mass" in St Patrick's Cathedral. Sometimes we rhapsodize about the past, glamorize history and remember only what is pleasant. As a Catholic community in New England, we should know that our beginnings as a local Church were fraught with hardship and hostility and with enormous sacrifices. In the good ol’ days, here in Boston, there were laws that were very anti-Catholic. Priests were not allowed into this colony. If a priest were to be found, he was to be banished. If he returned, he would be executed. And each year, as people sang, “Remember, remember, the 5th of November,” the pope was burned in effigy on the Boston Common. I am sure that those early residents of the Bay State would be horrified if they had known that Pope John Paul II would one day come to the Boston Common and celebrate the Eucharist there for about 400,000 people. The Advent readings remind us that we must press on to the future. With hope, but also with a great sense of the urgency of the Gospel. St. Paul tells us, “It is the hour for us to wake from sleep, for our salvation is nearer now, than when we first came to believe.” Jesus tells us to be prepared for the coming of the Son of Man. He uses the image of Noah’s ark. He says, just as some people were caught up in the routine of their daily lives, so today, we must be aware of allowing ourselves to be so distracted by the demands of each day, as to miss the moment that the Lord offers to us. To literally miss the boat, as those people did in Noah’s day. The fathers of the Church use the ark of Noah as a metaphor for the Church. Last year, when I spoke to the [Boston] Men’s Conference participants, I said, “the Church is like Noah’s Ark, a floating zoo.” Some people have jumped ship, others are seasick. Some are rowing in one direction and others in another. What we must never lose sight of, is that Jesus Christ is the captain of the ship. And he is summoning us, “All hands on deck.” Every baptized Catholic must know that we have a personal call to holiness, to a vocation to be part of Christ’s mission — “All hands on deck.” The ark reminds us that we have been reborn in the waters of baptism. Those waters have made us part of Christ’s family. But we are truly his brothers and sisters, when we obey the will of the Father. The Christian project is not a selfish search for salvation. It’s not “Jesus and me and the warm fuzzies.” It’s about serving others, about spreading the Gospel. We might feel more comfortable in our own lifeboat, but Jesus wants us on Noah’s Ark and it is, “All hands on deck.” It’s time to recommit ourselves to the mission that is entrusted to us, to witnessing to Christ’s Gospel, to passing on the faith, to building on a civilization of love. If some of our brothers and sisters in faith have grown disillusioned and stepped away, then I invite them to come home. Noah’s Ark may have sprung a leak, but it is not sinking, and Christ is the captain. Like the Apostles, we may fear that the Lord is asleep in the stern, but he assures us of his loving presence, especially during the stormy night. To our brothers and sisters in the life rafts, I say, “We love you, we want you to return to the practice of the faith, to the faith of our ancestors, the faith of the saints, the faith of the Apostles.” Is it going to be easy? No. Will the Globe say nice things about us? No. No, it will not be easy, but it will be good. This is all well and good, of course, but a reissue of Patterns -- the work commissioned for the Baltimore bicentennial in 1989 -- would be sweeter still... to say nothing of an update. Suffice it to say, a scribe can dream.